For the longest time, all that really meant to me was that it’s a long weekend, and the pools open. What it is meant to point out is that each and every year, members of our community go off to alien places and die for a cause they believe in. While you may or may not believe in, agree with, or otherwise condone the actions of our military, the soldiers of which it is constituted are still people, like you and me, going off to places to deal with things that many of us never have to think of. As my own token of respect and appreciation I selected three fallen soldiers from the Washington Post’s Faces of the Fallen project. While selected at random, I couldn’t believe that each of these people were under 30. Caryn graduated high school the same year I did less than 10 miles away. 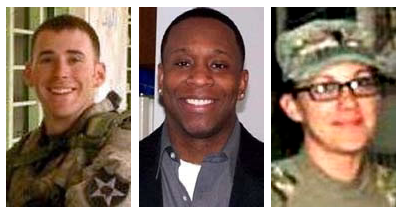 All three of these soldiers had spouses and children they left behind. They had so much life ahead of them that they’ll never know. There’s no way to know what they may have been thinking as they were deployed, or in their final moments. But at the least we should try. Try to understand what they might have felt, the abnormal duality of fear and courage, panic and military professionalism. Or simply recognize the fact that these were people who went out to do a job to support their families, and defend a cause that they believed in so deeply they paid the ultimate price. That’s what Memorial Day is really about.